A Connecticut resident filed suit for negligence after injuring herself while walking to the Danbury Hospital parking lot. She prevailed during a bench trial, and the defendant appealed. 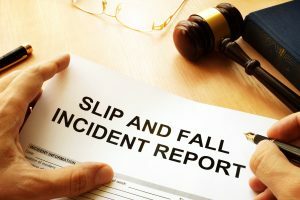 The Connecticut Court of Appeals affirmed the lower court’s decision, which may be interesting to Massachusetts slip and fall claimants as well.In June 2010, the victim and her daughter were visiting the victim’s husband, who was being treated at Danbury Hospital. After their visit, they exited the hospital’s main building and walked onto a walkway leading toward the parking lot. They were familiar with this walkway, since they had made this same trip several times in the past. While they were walking along the pathway, the victim hit something with her foot and fell to the ground. As a result of the fall, she sustained injuries to her right foot and ankle. It later was determined that she had broken her big toe and damaged the fifth metatarsal of her right foot. Within minutes of the fall, she was taken to Danbury’s emergency room, where she was examined and treated for her injuries. As a result of her fall, she experienced chronic lower back pain from a protruded disc that required several epidural steroid injections and, eventually, a surgical decompression procedure. The lower court ruled for the victim following a bench trial. 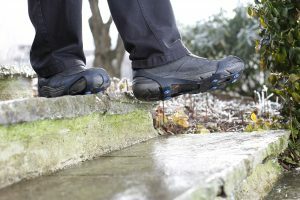 On appeal, the defendant first claimed that the trial court erroneously found that the defect in the walkway that caused the plaintiff’s injuries was a reasonably foreseeable hazard. The appeals court disagreed, reasoning that the trial court reviewed reports prepared by members of the defendant’s security and medical staff, as well as photographs depicting the alleged defect and the surrounding area, and it heard the testimony of the plaintiff and her daughter describing the fall and the defect. The trial court therefore had before it adequate evidence of a broken slab of pavement that contained a chip in a well-traveled walkway that had existed for a sufficient period of time. Thus, the appeals court concluded that the findings related to this claim were not clearly erroneous, and the conclusions were not unreasonable. A plaintiff was injured after she tripped on a bent stake jutting onto the walkway outside her condominium unit. She thereafter filed suit, alleging that the owner of the complex, Huntington Wood Condominium Trust, and the contractor responsible for snow removal, The Green Company Landscape & Irrigation, Inc., negligently maintained a hazardous condition that caused her injury. The superior court disagreed, finding that she failed to establish that the defendants had actual or constructive notice of a supposedly dangerous condition. The judge therefore granted the defendants’ motions for summary judgment. The plaintiff appealed, and the Massachusetts Court of Appeals affirmed.She alleged that in mid-March 2010, she injured herself when she tripped on a stake that poked out onto the walkway next to her condo unit. She passed that stake approximately three times that day before falling. She noticed that it was bent but did not realize it was jutting out onto the walkway. In the evening, she walked to her car. When she returned from her car, she tripped over the stake. Plaintiff Eric Halbach suffered serious injuries when he tripped on uneven pavement on a public sidewalk next to a building owned by the defendants. Halbach and his wife, Kathleen, subsequently sued, alleging that the defendants had a duty to either repair the sidewalk or warn pedestrians and the city of Boston of the hazard. Concluding that no such duty exists, a judge of the Superior Court granted the defendants’ motion for summary judgment. The appeals court affirmed.In June 2009, Halbach was walking on Clarendon Street in the city, near the John Hancock garage. He tripped and fell on uneven pavement on a part of the sidewalk next to the garage, sustaining significant injuries as a result. The sidewalk where Halbach fell is owned by the city. At the time of the fall, the commercial property adjacent to the sidewalk was owned by defendant 100 & 200 Clarendon Street LLC and maintained by defendant Normandy Real Estate. After the incident, Normandy hired a company to grind down the uneven payment at a cost of $798. A Massachusetts appeals court recently reversed a lower court’s grant of summary judgment to a defendant retail store following the plaintiff’s injury in the store, despite admitting that the plaintiff did not have a very strong case.Defendant Boys in Berries, LLC operates a farm and retail store in Sharon, Massachusetts. In July 2010, Maria Belanger arrived at the farm store with her husband, Ray, entering the store while her husband stayed in the car. Belanger selected a few items to purchase and went to check out. At the end of the checkout counter was a large cardboard box placed on top of a wood pallet. The box and pallet were directly adjacent to the end of the checkout counter, set back several inches from the vertical surface of the counter. From the checkout line, the top of the box was visible, but the square pallet on which it rested could not be seen. While in line, Belanger noted that the box was octagonal. The Massachusetts Court of Appeals recently reversed a lower court’s grant of summary judgment to defendant A Plus Auto Body regarding a plaintiff’s lawsuit for negligence following a slip and fall.In February 2013, plaintiff Nicole Fleming parked her rental car on Walnut Street while going to retrieve her own car from A Plus. As she exited her car, she slipped and fell on a patch of ice and broke her leg. Fleming sued, alleging that A Plus’ negligence caused her injury. The trial court granted A Plus’ motion for summary judgment on the grounds that it did not own or control Walnut Street, a public way, and that there was no evidence that it created a buildup of ice on Walnut Street. Fleming appealed.